All in step with wing in wing . . . Chicks can conquer anything! Nerdy Chick has been waiting all day for the Rocket Club meeting. But when she gets there, she finds a disturbing sign tacked to the door: "NO CHICKS ALLOWED!!!" Puzzled, then baffled, then just plain mad, Nerdy Chick sets out to change the rules. Along the way, she meets other chicks who are just like her: passionate and determined. From Soccer Chick to Science Chick and Wordy Chick to Yoga Chick, these chicks aren't willing to take "NO" for an answer. They rally together, march to the barn at the center of town, and—when they hear "NO" once again—chart their own path forward (or, rather, up, up, and away!). 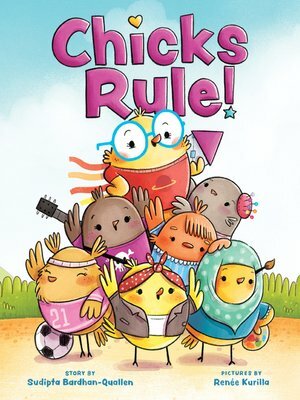 A celebration of girl power and community action, Chicks Rule! is the playful, diverse, victorious anthem chicks everywhere will love. Sudipta Bardhan-Quallen is the author of many children's books, including Tyrannosaurus Wrecks!, Quackenstein Hatches a Family, and Brobot Bedtime. She lives in New Jersey with her family. Renée Kurilla is the illustrator of many books for children, including The Pickwicks' Picnic and the Ada Lace chapter book series. Renée was a lead artist at FableVision Studios for nearly 10 years. She lives just south of Boston with her family.